The sixth week of the sixth season of the US Chess League was interdivision week, in which the West and the East divisions faced off. The Western teams prevailed over the Eastern teams, winning 4.5 out of 8 matches. The most interesting matchup was between the Boston Blitz and the San Francisco Mechanics, two teams that consistently field strong lineups every week, as well as strong teams every year. 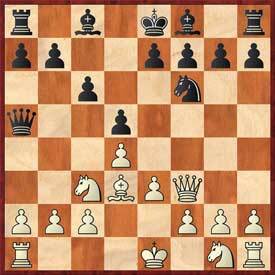 Boston won 2.5-1.5, with wins on the top 2 boards by GM Larry Christiansen and IM Marc Esserman. Boston moves up to second place in the playoff hunt, behind the New England Nor'easters and ahead of the New York Knights and the Baltimore Kingfishers, who won a very close match against the Arizona Scorpions. Manhattan, Philadelphia, New Jersey, and Carolina are all significantly behind fourth place, meaning they will really need to step it up in the final 4 weeks if they are to have any chance of making the postseason. The Western playoff picture was muddled heavily where the playoff leaders lost and the lower teams moved up. The Chicago Blaze find themselves in 1st place of the division after beating the Philadelphia Inventors, 2.5-1.5. San Francisco and Arizona are tied for 2nd and 3rd place, while there is a 4-way tie for the last postseason spot between the Seattle Sluggers, who won 2.5-1.5 against New Jersey, the Dallas Destiny, who won 3-1 over Carolina, the Los Angeles Vibe, who drew Manhattan, and the Saint Louis Archbishops, who lost 3.5-0.5 to New England. The Miami Sharks are currently in last place, despite a nice 2.5-1.5 win over a very strong New York team, but they are only a half point behind the fourth place teams, meaning it's far from clear as to who will be representing the West in the playoffs this year. Stay tuned to uschessleague.com for links, lineups and details-now let's move on to the match highlights! The Destiny were part of the most exciting match for the second week in a row! All 4 games were decisive, unique, and interesting, featuring intense complications and serious material imbalances. IM Salvius Bercys covered the match on the Dallas Destiny team blog. FM Ron Simpson analyzed his wild game against IM Julio Sadorra for the Carolina Cobras team blog. 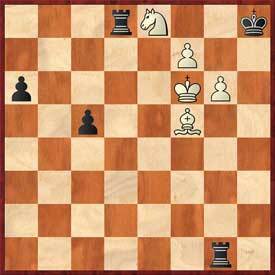 The Marshall Gambit, named after American player Frank Marshall who first played this opening in the early 20th century, is a very sharp pawn sacrifice where White usually gets a powerful initiative against a Black king stuck in the center. 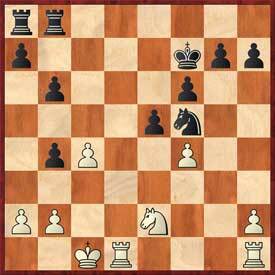 Black is just two pawns up and went on to win the game quite comfortably, thanks to the opening! I'll be interested to see if anyone could come up with an improvement for the White side in this particular line. This endgame started on move 26, when both players had close to an hour on their clock, and when both players were left with a queen, 2 bishops, a knight, and 7 pawns each. The position was fairly equal, with Black getting a slight pull due to the control over the light-squares. What intrigued me about this endgame was how GM Becerra was able to create a winning advantage by slowly improving his position and finding a way to trade down favorably into an endgame with a queen and a good knight versus a queen and a bad bishop. This then led to an easily winning queen and pawn endgame which Becerra had no problem converting to a win using his strong advanced kingside pawns and White's exposed king. Playing Black against the higher rated IM Eli Vovsha, Alexandre reached the following position after 7 moves in a Veresov opening, which was never seen before. Here, Alexandre found the very instructive and thematic pawn thrust 7...e5!, which allows Black to seize the initiative. The true beauty behind this move lies in the follow-up: 8. dxe5 Ba3!, a very aesthetic tactical shot which led to a better game for Black after 9. exf6 Bxb2 10. fxg7 Bxc3+ 11. Kf1 Bxg7 12. Rd1 Be6. Alexandre went on to win this quite interesting game. 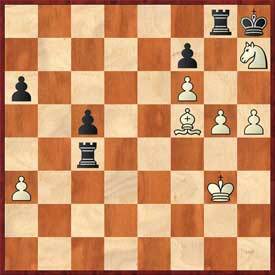 Black had a small advantage due to the pressure on the d-file and White's lack of serious counterplay on the kingside. Of course this did not stop White from attacking! 31.Re3 g6 32.Qe2 Nd4 33.Qg4 Nbc6 34.f4 Nf5 35.Ree1 Ncd4 36.Be4!? Sacrificing the exchange! 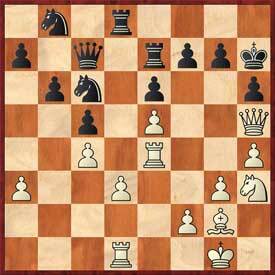 Of course, Rc1 was much safer after which Black would remain with a pleasant advantage. 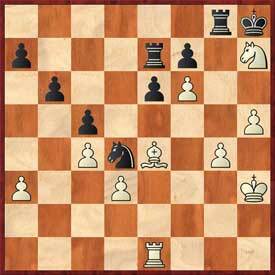 36... Nc2 37.h5 Nxe1 38.Rxe1 Qd7 39.Qf3 Rg8 40.Kh2 Kh8 41.g4 Nd4 42.Qf2 Qa4?! Refusing to sit back and wait for White to develop serious threats, but the queen would have been very useful covering the h4 square 42...Qd8 43.Rg1 Rd7 44.g5 Qf8-/+ 43.Qh4 g5? Now White can develop serious threats! 43...Qc2+ was best 44.Kh1 Qd2 45.Qf6+ Rg7 46.Rb1 Ne2! 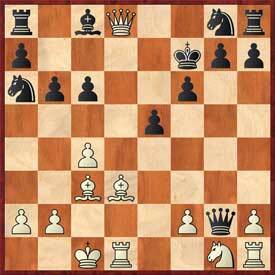 47.Qxe7 Ng3+ 48.Kg1 Nxe4 49.dxe4 Qd3-+ Material equality will be restored, but White will have awfully weak pawns. 44.fxg5 hxg5 45.Nxg5 Qc2+ 46.Kh3? 46.Kh1! 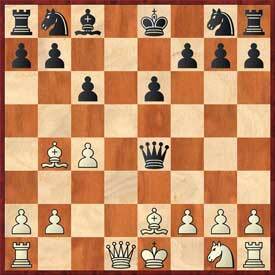 forces an advantage after: 46...Qd2 47.Nh3 Rxg4 48.Qf6+ Kg8 49.Rg1! Rxg1+ 50.Nxg1 threatening to play either Qxe7 or promote the h-pawn 50...Ne2 51.Qf2± with a likely winning endgame 46...Qd2 47.Nh7? 47.Nf3= 47...Qf4? 47...f5! was winning 48.exf6 Rxh7 49.Bxh7 Kxh7 50.Qg3 Qg5-+ 48.Qf6+ Qxf6 49.exf6!? After 49.Nxf6 White has excellent drawing chances, but frustratingly few winning chances! 49...Rd7 50.Kh4 a6 51.Rf1 b5 52.g5!? Going for it! 52...Nf5+ 53.Rxf5!? What else? exf5 54.Bxf5 Rd4+ 55.Kg3 bxc4 56.dxc4 Rxc4? The Sweetest Swindle! The inaccurate play was understandably due to mutual time pressure, and regardless of mistakes, we were entertained by the fantastic effort. That's it for this week! Check back here every week for USCL highlights. Follow all Week Seven action live on the Internet Chess Club and find pgn downloads, line-ups, blogs and Game of the Week details on uschessleague.com. For more of Kostya's writing, check out the LA Vibe team blog, http://happychess.blogspot.com/ and his first CLO article on USCL Week Five Highlights.